A common reason many cats get taken to the groomer is for matting. Sometimes cats mat because they are older, overweight, arthritic, and just can’t get to certain areas on their body and groom as well. If owners don’t regularly brush their long haired cats, they can get so matted that it’s painful for the cat and no longer possible to humanely brush or comb them out. But there are options. What is a Lion Shave? The term Lion Shave is used by veterinarians and cat groomers to describe the haircut done on cats when they are completely shaved down. 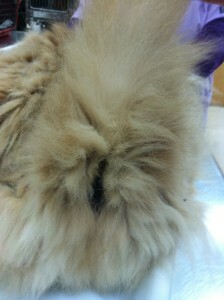 This grooming technique is a shave very close to the cat’s skin on their body, belly and chest, leaving long hair on the legs, around the cat’s head, and on the tail. Besides matting, some cats shed heavily and may have or cause allergies. 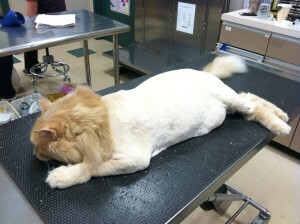 Therefore, a lion shave can be performed on either a long or short haired cat for various reasons. We have a feline patient in our practice named Oliver who has very long and dense fur that gets easily matted in certain areas. 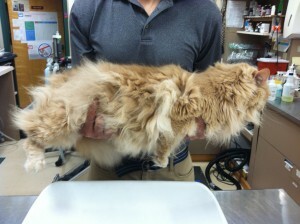 When cats get matted like this, it can become painful and silently bother them. Many cat owners don’t realize it until we do a lion shave grooming on them. 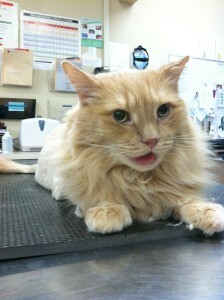 Oliver gets a Lion Shave every spring and loves it! After the Lion Shave, he immediately feels more comfortable and cleaner. 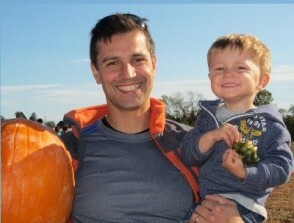 He goes home feeling happier and often becomes more affectionate. If your cat’s fur is matted or you have other concerns, it is best to seek out a qualified professional cat groomer or talk to your veterinarian about a grooming technique such as a Lion Shave. Please do not attempt to do this at home yourself. Only those properly trained should perform this type of grooming procedure. Certain areas on the cat’s body are high-risk for nicking and injury, and trained professionals know the limits of your pet’s body and how to avoid injuring your cat. Also, some cats may not be the best candidates for a Lion Shave and will become stressed or aggressive. Let your veterinarian guide you. Your veterinarian or groomer can also give you advice on how to manage your cat’s grooming requirements as the fur grows back in and how to stay on a regular grooming schedule. 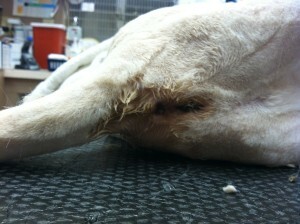 This entry was posted in General Pets, Veterinary Services and tagged Cats, Felines, Pet Grooming. Bookmark the permalink.